Weather. Unchangeable. Fickle. Variable. Enjoyable. Severe. 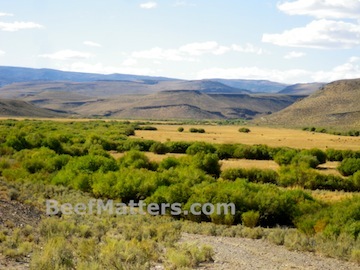 Weather has a tremendous impact upon our ranch from day to day and year to year. As much as we try to plan, both short-term and long-term, those plans are nearly always dependent upon the weather. This year has been a surprisingly wet year for our ranch. We received tremendous moisture in the spring and summer. What do I mean by tremendous? Well, it’s all on the eye of the beholder, isn’t it? The average annual precipitation for our area is 10″. That’s ten inches of total rain or snow. In one year. Basically, we live in the middle of a desert. When it does rain, the ground soaks it in and the grass shoots skyward. This year our area has received far more than the average amount of annual precipitation. 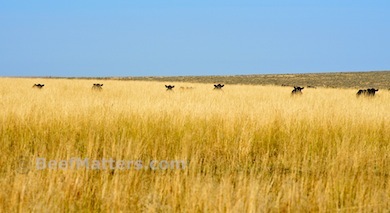 In other words, we are enjoying a good grass year on most areas of our ranch. Those ears you can barely see through the grass? 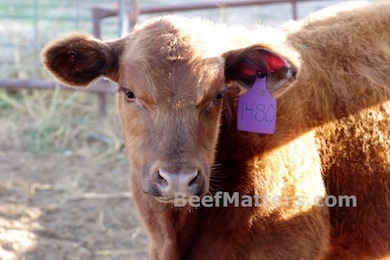 They belong to a group of steers we bought earlier this summer out of north-central Nevada. 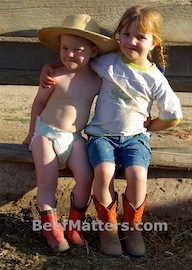 I do believe they are content living on our ranch! While we are reaping the benefits of a good grass year, I have many friends in the southwestern United States who are suffering through a severe drought. The stories they tell of selling their cows because there is simply no feed available are heartbreaking and humbling. I listen to their stories and offer words of support, feeling futile and helpless. Then I remember the many phone calls and emails I received from these friends when we were coping with the Murphy Complex Fire here in Idaho. I remember how touched I was that they took the time to let us know they were thinking of our family and our livestock. 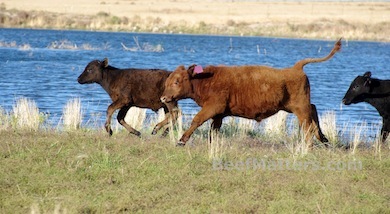 It is a reminder that cattle producers across the country all face severe weather in their regions. Knowing how hard we all work to produce a a safe beef supply, we feel each others pain in the face of harsh, cruel weather conditions. Like many, I am praying that the rains will soon arrive for that region of our country. 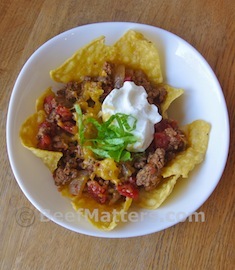 Today’s recipe in the Cooking Light Ground Beef Series is Chili-Corn Chip Pie. 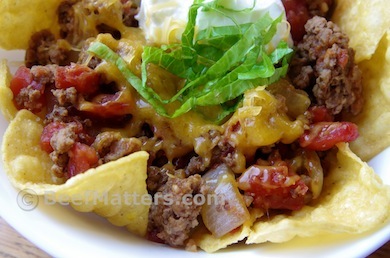 This recipe is based on the Fritos Chili Pie often seen at county fairs and festivals. Have you ever had a Fritos Chili Pie? The concessionaire slices open the side of a small bag of Fritos, ladles chili on top of the Fritos and allows you to garnish as desired with cheese, sour cream, or onions. I had my first (and only) Fritos Chili Pie a few years ago at a small county fair. I will admit to you that I was seriously underwhelmed. Thinking back, the problem was that the chili wasn’t great and I let that one experience keep me from ordering another Fritos Chili Pie or attempting to re-create it for my family. Consequently, I was having a tough time mustering up any enthusiasm. Then I looked at the recipe again and realized that although the chili was simple, the ingredients were flavorful and should make a good-tasting chili. I pulled out my skillet and went to work. Heat large skillet over medium-high heat. Coat pan with cooking spray. Add beef to pan; sauté 5 minutes, stirring to crumble. Remove beef; drain. Wipe pan clean with paper towels. Add onion to pan; sauté 4 minutes, stirring occasionally. Add garlic; sauté 1 minute, stirring constantly. Stir in beef, cumin, pepper, and salt. Stir in tomato paste; cook 1 minute, stirring occasionally. Add broth, 1/3 C. water and tomatoes; bring to a boil. Reduce heat to medium, and simmer 15 minutes or until slightly thick, stirring occasionally. Remove from heat. Place 1 ounce chips in each of 4 bowls, and top each serving with about 2/3 cup beef mixture, 2 tablespoons cheese, and 1 tablespoon sour cream. Sprinkle each serving with 2 tablespoons green onions. I was forced to make two substitutions: I did not have Fritos on hand, nor could I find them at the grocery store in my small town (apparently there was a run on Fritos this week! ), so I used regular corn chips instead. And I would have sworn I had green onions, but when I went to get them out of the fridge they were no where to be found. I finally decided to add a little romaine lettuce for the color. Oops! While my oldest son was busy tending to his 4H steers all summer, my younger kids were charged with taking care of our three leppies (orphan calves). The calves spend the day in a small pasture behind our barn. They eat grass, loll about in the shade and occasionally, when they are feeling frisky, they run and play. Every evening, the kids bring the leppies into a small pen in the corral and lock them in for the night. They carefully measure out grain and haul water to the leppy pen. In the morning, the kids open the gates and put the leppies out to graze for the day. The leppies are the primary responsibility of my eight year old. He is learning so much from this experience. 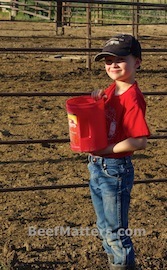 For instance, he has discovered that it is much easier to pack around coffee cans than five-gallon buckets. He is quite conscientious about the amount of grain he feeds his leppies, keeping track of how much they eat and when he needs to increase their feed. My eight year old receives a great deal of assistance from his younger siblings. Otherwise known as the “clothing-optional” crew.